"Characterisation of the top atomic layer"
For catalysis the characterisation of the top surface layer of atoms is essential and the Qtac100 is the perfect tool for this application. In this example it is used to study sub-monolayer coverages of Te, Nb and Sb oxides on Mo-V-O. This multi-component catalyst is used for the conversion of propane feedstock to acrylic acid and acrylonitrile, intermediary chemicals for the production of clothes, home furnishings, paints, adhesives etc. The results show the surface composition of Mo-V-M-O (M=Te, Nb, Sb) catalysts. A study of different surface concentrations of Te, Nb and Sb reveals which combination gives the optimum selectivity and reaction rates. 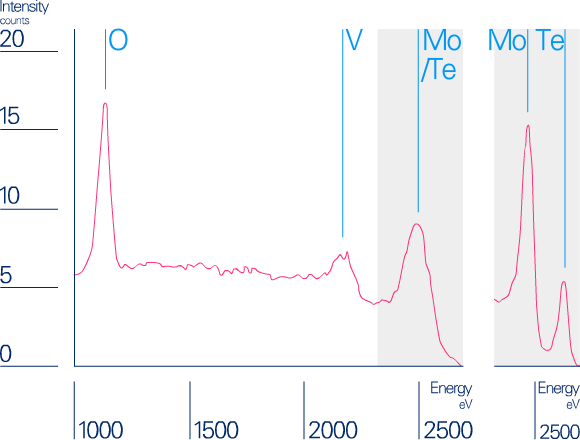 Energy spectra showing the elements present in the top atomic layer of a Mo-V-Te-O catalyst. The inset shows a higher resolution spectrum acquired using Ne instead of Helium ion scattering. The example below shows the Zn/Cu ratio measurement after different reduction treatments. 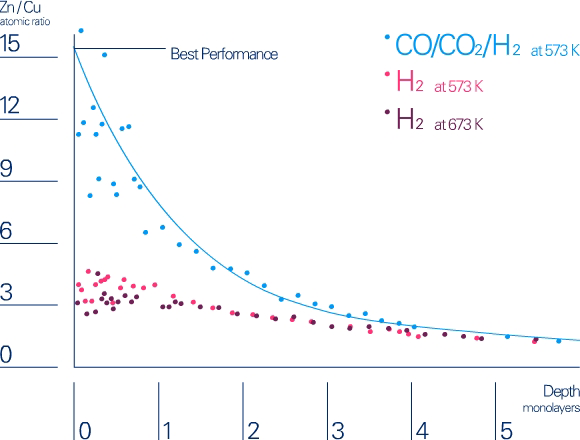 The reduction process with CO/CO2/H2 treatment at a temperature of 573 K gives the best performance. This leads to the assumption that a surface concentration of Zn results in a higher performance of the catalyst.